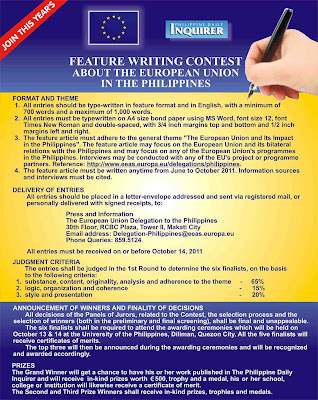 The European Union (EU) and the Philippine Daily Inquirer (PDI) is calling all campus journalists to join a feature writing contest about the European Union in the Philippines. 1. All entries should be type-written in feature format and in English, with a minimum of 700 words and a maximum of 1,000 words. 2. All entries must be typewritten on A4 size bond paper using MS Word, font size 12, font Times New Roman and double-spaced, with ¾ inch margins top and bottom and ½ inch margins left and rights. 3. The feature article must adhere to the general theme “The European Union and Its Impact in the Philippines”. The feature article may focus on the European Union and its bilateral relations with the Philippines and may focus on any of the European Union’s programmes in the Philippines. Interviews may be conducted with any of the EU’s project or programme partners. Reference: http://www.eeas.europa.eu/delegations/philippines. 4. The feature article must be written anytime from June to October 2011. Information sources and interview must be cited. 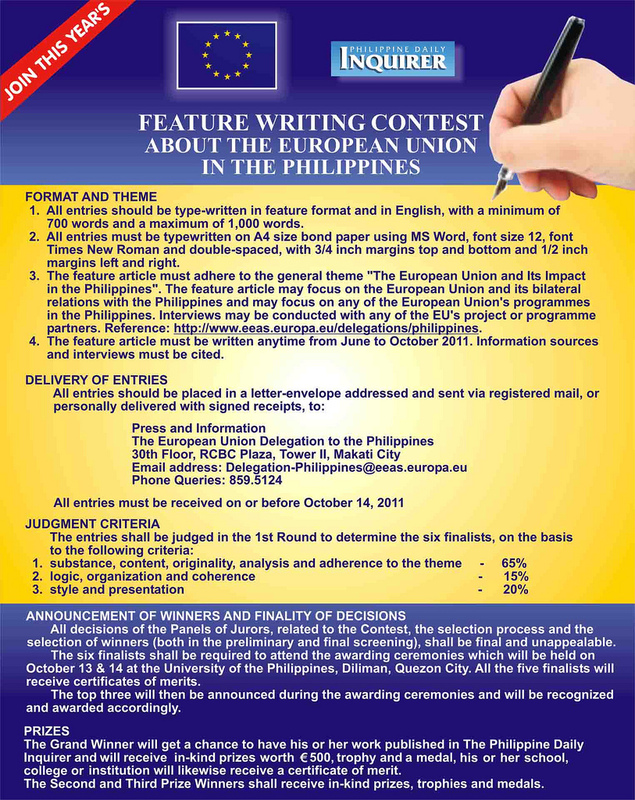 All entries must be received on or before October 14, 2011. All decisions of the Panels of Jurors, related to the Contest, the selection process and the selection of winners (both in the preliminary and final screening), shall be final and unappealable. The six finalists shall be required to attend the awarding ceremonies which will be held on October 13 & 14 at the University of the Philippines, Diliman, Quezon City. All the five finalists will receive certificates of merits. The top three will then be announced during the awarding ceremonies and will be recognized and awarded accordingly. The Grand Winner will get a chance to have his or her work published in The Philippine Daily Inquirer and will receive in-kind prizes worth €500, trophy and a medal, his or her school, college or institution will likewise receive a certificate of merit. The Second and Third Prize Winners shall receive in-kind prizes, trophies and medals.